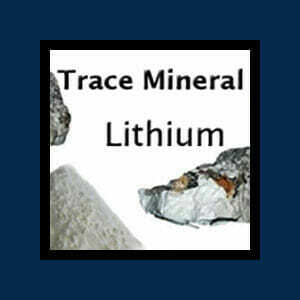 Lithium is a trace mineral (alkali metal) much like sodium and potassium. It is most known for its use in treating mental health disorders such as bipolar or manic-depressive disorder. Researchers now believe lithium to be an essential mineral. This trace mineral has been used as a mood stabilizer for decades. It is used in the form of lithium salts such as prescription lithium carbonate or lithium citrate and non-prescription lithium orotate or lithium aspartate. Ongoing research is finding lithium to be a key element in brain “anti-aging” due to its ability to increase brain cell mass, which in turn increases mental alertness and memory. A study done by The Lancet found, “Lithium exerts neurotrophic or neuroprotective effects“. Neurotrophic refers to a family of proteins that induce the healthy development, function, and survival of neurons. Neuroprotective refers to processes within the nervous system that protects neurons from degeneration. Increased neuroprotective effects in brain cells prevent cell death caused by neurotoxins, free radicals, chemicals that deplete brain cells including alcohol and drugs, radiation, and dangerous stress-induced hormones such as cortisol. There has even been evidence that lithium may enhance the proliferation and specialization of neural stem cells. This proves to be exciting because we know that brain cells are lost during the aging process, and the action of lithium on these cells seems to replace the lost brain cells. Research surrounding lithium and other disorders and diseases from migraine headaches to Grave’s disease is just beginning. The evidence is now showing that areas of low lithium content in the environment have dramatic effects on the population. Tracking the amounts of minerals, toxins, and chemicals in an environment can be simply done by measuring the content found in hair, blood or urine. By studying the amount of lithium in the systems of people in different populations, a graph of behavior can be measured. These kinds of trends have also been noted for other trace minerals lacking in the environment. For example, an increase in the incidence of arthritis and osteoporosis in areas lacking in the trace mineral boron. Typical dosages of lithium orotate range from 30 mg – 800 mg per day. The higher dosages are usually broken up into 3 dosages per day and are most often for those with bipolar or manic disorders, those recovering from alcoholism, or some of the other disorders listed in ‘Conditions that Lithium May Help’. It is best to start with 1 tablet of 120 mg (~5 mg of elemental) 1 – 3 times per day. This is most often sufficient. However, especially in some bipolar or manic disorders, an increase to 2 tablets 3 times a day may prove to be more effective. In rare cases, up to a total of 8 tablets broken into 3 doses per day may be used until stable. After that, a lower dose can be used. For maintenance, typically 1 tablet twice per day. For more information, please see ‘Lithium Orotate: Misleading Research’ as well as all lithium articles listed at the bottom of this page. An excellent website for further lithium orotate research can be found at Lithium Orotate Works! Lithium orotate should never be confused with lithium carbonate. Lithium carbonate can be toxic; blood levels must be checked regularly. Lithium orotate is NOT toxic. An excerpt from The Importance of Lithium Supplementation by Jonathan V. Wright, M.D. This example involved toxic lithium carbonate, not lithium orotate and yet the toxic symptoms were still reversed and then prevented from returning with a simple few supplements that people should be taking every day anyway.